The all-new 2018 Eclipse Cross is a fusion of sharp coupe looks and dynamic SUV mobility with signature Mitsubishi styling, technology and driving confidence. It joins the formidable line-up of the other popular Mitsubishi SUVs like the legendary Pajero, Montero Sport, Outlander and the ASX. The Eclipse Cross contains many all-new features including a 1.5-liter direct-injection turbo- engine, Keyless Operation, Power-sliding Panoramic roof, Electric Parking brake, Head-Up Display (HUD), Forward Collision Mitigation System (FCM), Blind Spot warning and Lane Departure warning. A test drive was recently held at Dubai Autodrome for members of the motoring media, exclusive guests and automobile enthusiasts who put the all-new 2018 Eclipse Cross through its paces. “The 2018 Eclipse Cross is an all-new product offering in one of the popular motoring segments in the UAE and with the addition of the Eclipse Cross, Mitsubishi is well positioned to race ahead in the SUV segment.,” said Mr. C.V. Ravin, General Manager Sales – Mitsubishi, Al Habtoor Motors. 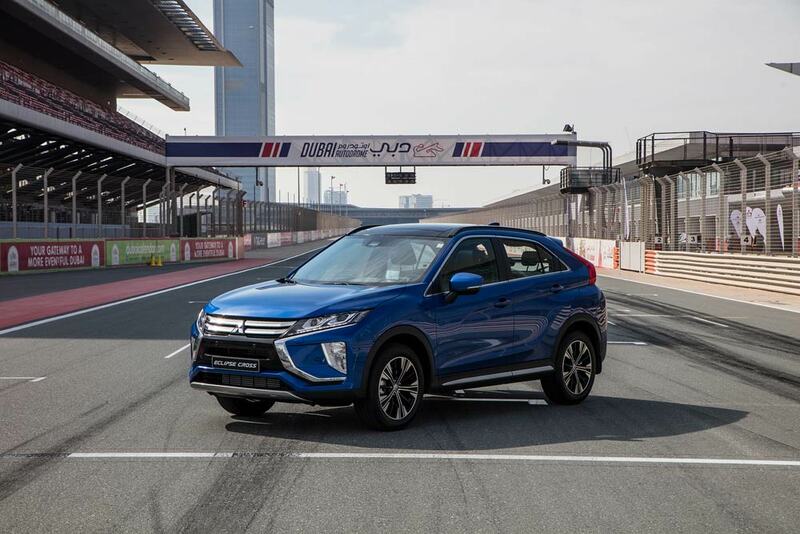 “Its distinctive styling, advanced technology and exciting performance, made the Eclipse Cross very appealing to all those who test drove the Eclipse Cross at Dubai Autodrome.”, he added. Available in three variants, the Mitsubishi Eclipse Cross aims to appeal to style-conscious drivers with its sharp coupé looks and muscular SUV stance, which delivers an enjoyable, reassuring feel that elevates the driving experience. The sharp and dynamic form of the all-new Eclipse Cross is distinguished by its wedge profile with its bold beltline and strong character line; a forward raked rear window; the sharply truncated rear gate and short overhang; and muscular wings that contribute to an athletic appearance. The front design features Mitsubishi’s trademark Dynamic Shield concept, which refers to the protective shield shape visually formed by the black central area and highlighted by bold bright work on either side of the grill. Distinctive auxiliary lamps are recessed deep in the front fascia adding drama and sophistication to the SUV’s front-on appearance. At the rear, the high-mounted, stretched rear lamps divide the rear window into eye-catching upper and lower segments and when illuminated the tubular LED and central LED brake lights form a single bar of light running across the tail, giving the Mitsubishi Eclipse Cross a broad and unmistakable appearance from the rear. The Mitsubishi Eclipse Cross also heralds the arrival of a new red body colour. The standard coating is layered with semi-transparent red and clear coating, and this creates high levels of colour saturation with a highly-refined finish. Inside, the new SUV’s dashboard is shaped using horizontal lines, with silver metal frames and a black and silver monotone colour scheme helping create a sense of refinement that is both dynamic and sporty. With its Rockford Fosgate Sound System that delivers the music reproduction of a quality home system and new Head Up Display, the futuristic cockpit inspires a sense of excitement for the driver. For maximum comfort and flexibility, the rear seat features a 60:40 split with long slide-and-recline adjustment. By detecting vehicles in the blind spot and alerting the driver in the mirrors this system helps to enhance safety and reduce accidents. The Rear Cross Traffic Alert system lets the drivers know if they are about to back into oncoming cross traffic. This feature is especially helpful when pulling out of a tricky driveway or manoeuvring in a crowded car park.